TV shows are one of the most popular and universal types of entertainment, yet with the rise of torrents, online streaming, and other methods of digital distribution, they often suffer from copyright infringement. In many regions, such programs can now be consumed through illegal channels, such as torrent-trackers and illegal streaming platforms. Unlike legitimate resources, torrent trackers and hosted files may send a user a file that looks like an episode of a TV show but is in fact malware with a similar name. 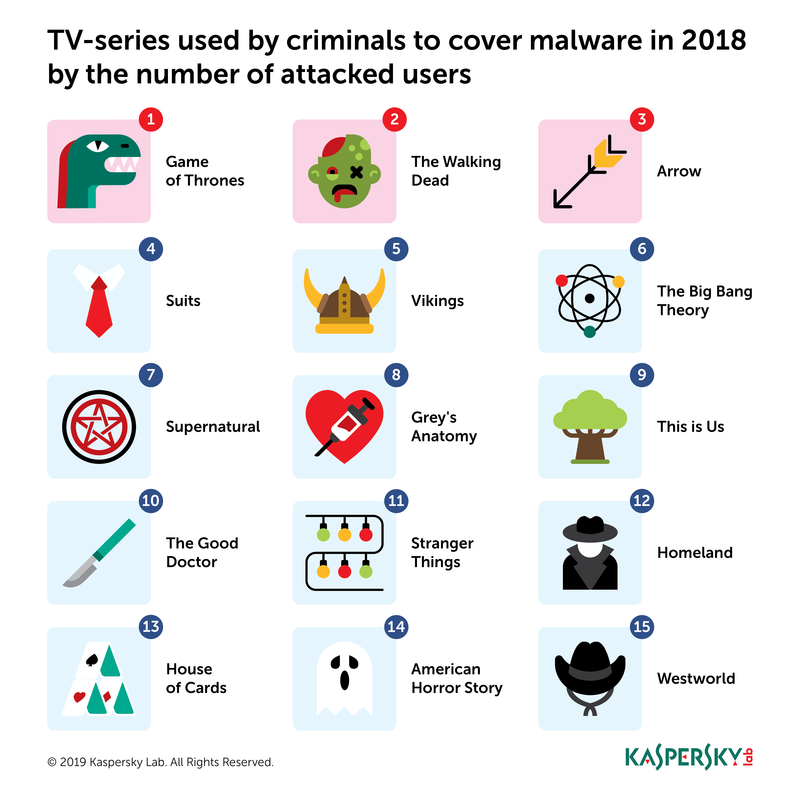 “We can see clearly that malware distributors exploit TV shows that are in high demand on pirated websites: these are usually actively promoted dramas or action series. The first and final episodes, attracting the most viewers, are likely to be at greatest risk of malicious spoofing. Online fraudsters tend to exploit people’s loyalty and impatience, so may promise brand new material for download that is, in fact, a cyberthreat. Keeping in mind that the final season of Game of Thrones starts this month, we would like to warn users that it is highly likely there will be a spike in the amount of malware disguised as new episodes of this show,” Said Anton V. Ivanov, security researcher at Kaspersky Lab.